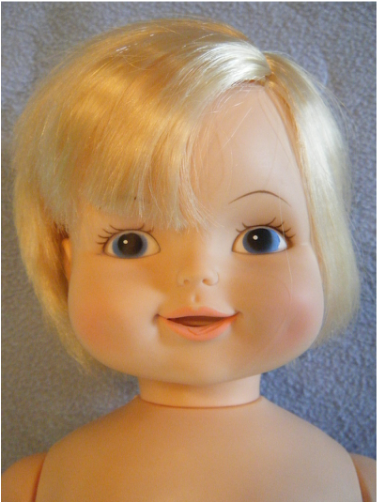 Baby Sez So is a Mego Corp. battery operated doll from 1976. We obtained this doll from eBay. She came in her original box, along with her instructions, her dress, her diaper and accessories (bottle, and spoon). She says 5 different phrases depending which of 5 switches are activated. She appeared to have never been used so we were optimistic that she would operated as soon as a battery was installed and the on/off switch activated. Unfortunately, that was not the case. Two likely problems would be a seized up motor, or a broken o-ring for turning the phonograph. This doll is unusual in that the motor axle is accessible without opening the doll. I put a drop of clock oil on the motor shaft and turned the tip of the motor shaft a few times using a very fine pair of needle-nosed pliers. Once that was done, 3 of the 5 speaking actions (diaper pin: "Mommy change me", flower pin: "Baby pretty now", and heart pin: "I love you, mommy) started to work. The spoon and bottle mechanisms in the mouth would not trigger. We decided that it was worth opening the doll (because she is sealed with screws) to see if we could restore the other 2 speaking phrases. It turns out that the levers coming from the head were stiff. Manually, running them through their motions got them working. The spoon activated phrase is "Yummy, yummy, yummy" and the bottle activated phrase is "I like my bottie". Apparently "bottie" is more baby-like than "bottle". The spoon works all the time now but the bottle mechanism has an issue. 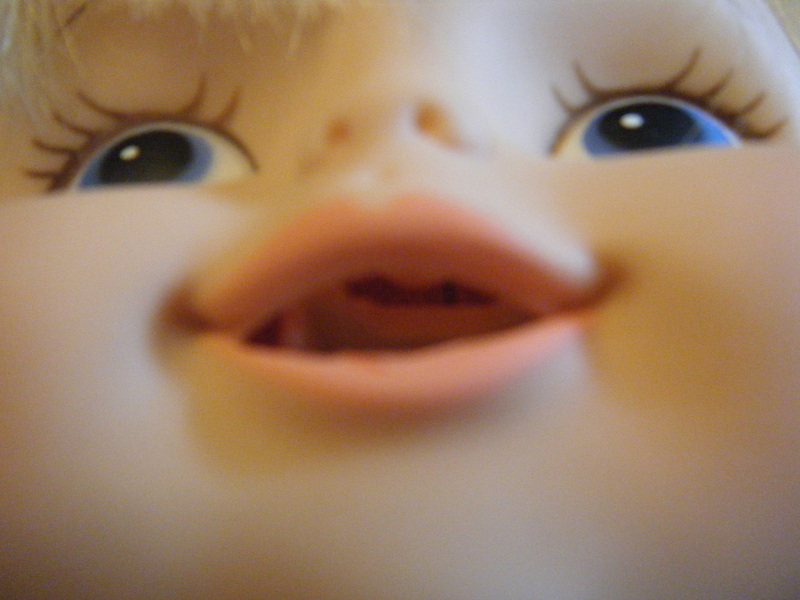 The cup-like activator in the roof of the doll's mouth is too far for the bottle's long tip to reach. We are able to activate it with a coffee stir stick and then have to reset it back into position because the spring loaded action is not working properly. It seems likely that this is a manufacturing defect or possibly an alignment issue arising from shrinking plastic. We did not feel it was worth trying to access the interior of the doll's head to remedy the situation. Baby Sez So came in her original box and still had the plastic bag for her body and the plastic bag covering her head and hair. 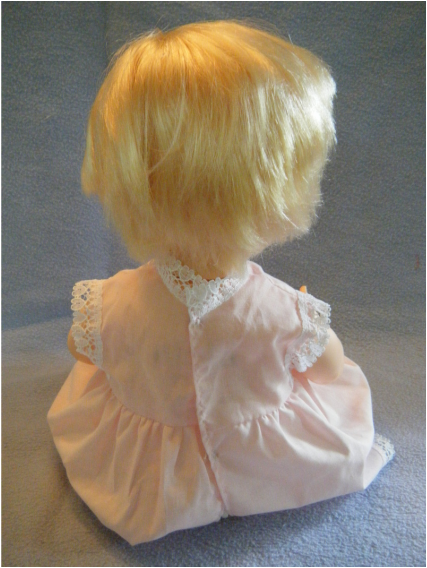 The doll's body was very clean except for a few black smudges on knees and elbows - possibly from laying on newsprint during the packing process. 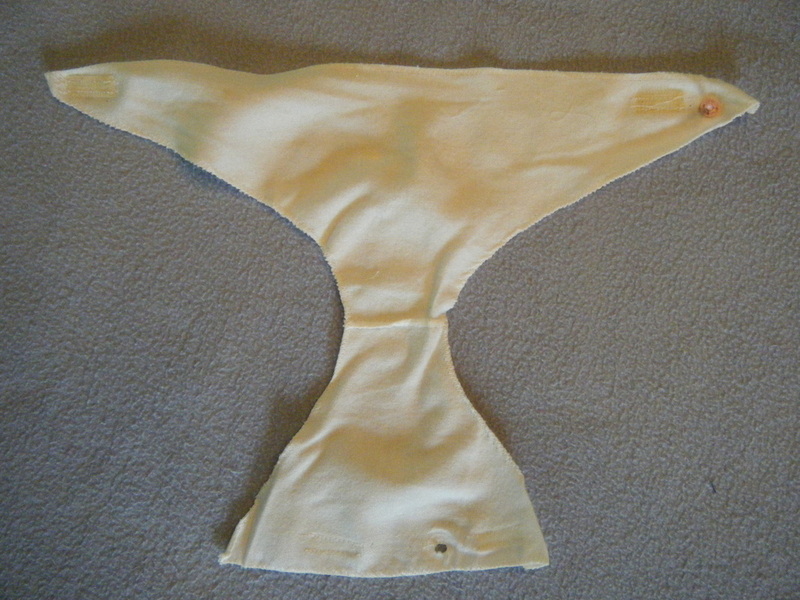 The 3 holes in the torso are where the 2 dress pins and the 1 diaper pin insert. The pins activate the talking mechanism. The doll's face was in perfect condition. The lower lip has a manufacturing flaw. 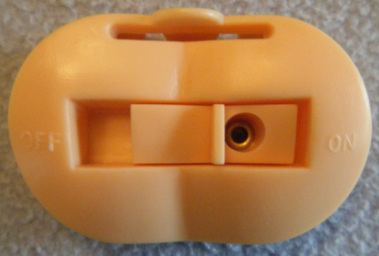 The battery cover is a must for a doll like this one - it contains electrical contacts and the on/off switch. 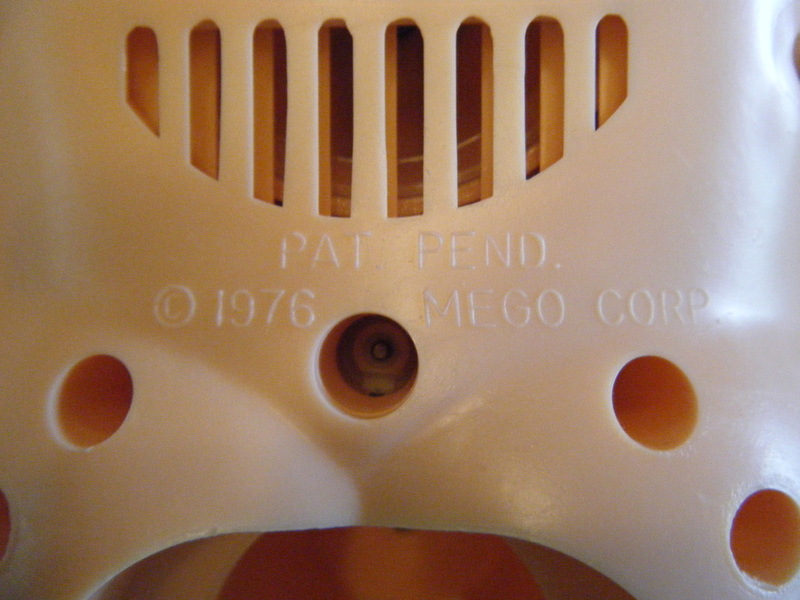 This the manufacturer's mark on the back of the doll's head. It says Mego Corp. 1976. 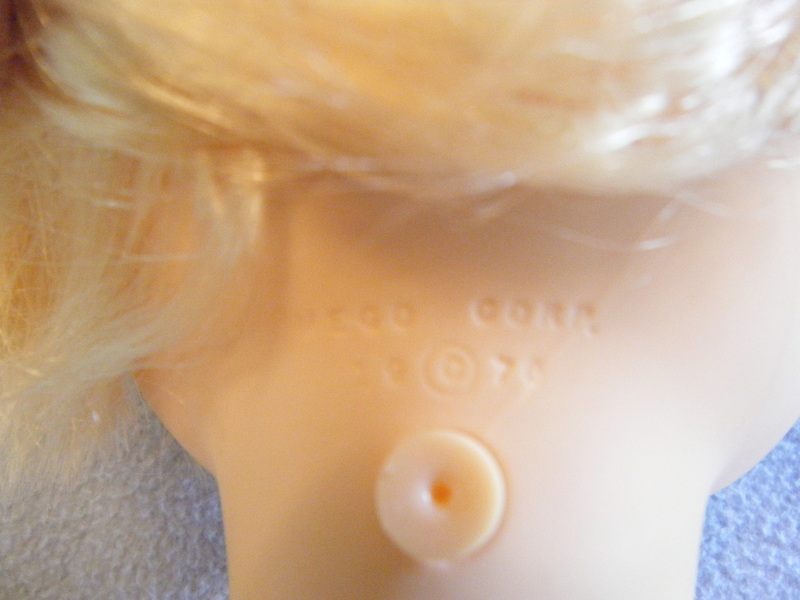 The large plastic button below the mark is really a plastic rivet holding the doll's head in place. This doll cannot rotate it's head because of the mechanical linkages passing through the neck. Once the motor was running again, 3 out of 5 speech functions were working. We debated leaving a "new" doll as is or opening it to go for 5 out of 5 speech functions. Since the doll is held together by screws we opted to carefully peek inside. The belly half of the body contains 3 grayish pieces that act as middlemen between the clothing pins and the switches on the voice circuitry. The inner workings of the doll's head are hard to see in a photograph. Straight back in the mouth is the trigger for the spoon. Toward the roof of the mouth is a small cup that catches the tip of the bottle and moves the rocker arm in the body. Unfortunately, the cup mechanism is too far inside the head for the bottle to reach. This is either a manufacturing defect or an aging issue connected to shrinking plastics. The doll's head is actually attached canted forward so I think it was a manufacturing defect. In any event, we didn't want to damage the doll by prying around inside her closed head cavity. Her hair was factory fresh, it smelled of Christmas morning of the 1960s and 1970s. It was a little flattened from living in her box for the last 40 years. 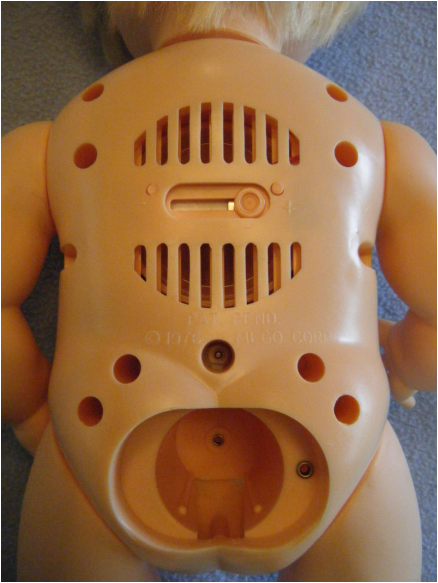 The back of the doll was a welcome site - it still had its battery cover and revealed that screws were used to hold the body together (a real bonus if the speech system needed to be operated on). The slider switch in the middle of the grillwork is for controlling the playback speed of the voice. This was intended to compensate for batteries running low on juice over extended use. The battery compartment on this doll is very elegant in its simplicity. There is a single contact at the bottom of the battery well and a second contact on the right side near the top. Its role will become apparent when the caption for the battery compartment photo is read. Seeing clean contacts was a huge relief. I don't think the doll had ever seen a battery. This is the inside of the battery cover. Notice that the two-legged electrical contact slides back and forth when the switch on the front is moved. 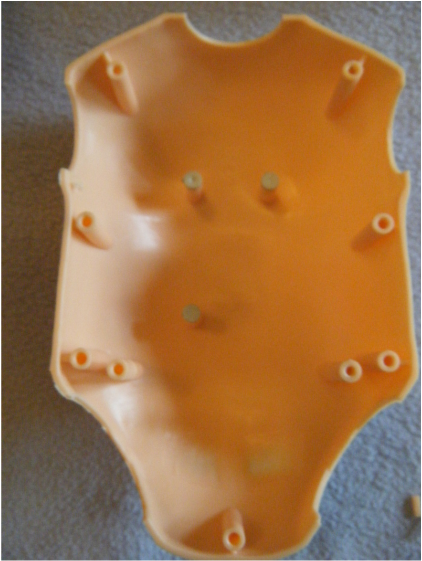 One leg comes into contact with battery terminal and the other leg comes into contact with the rivet in the battery well in the doll's body. Sliding the switch makes, or breaks, contact with the rivet in the doll's body which energizes or de-energized the circuitry. The inside of this doll was fascinating. 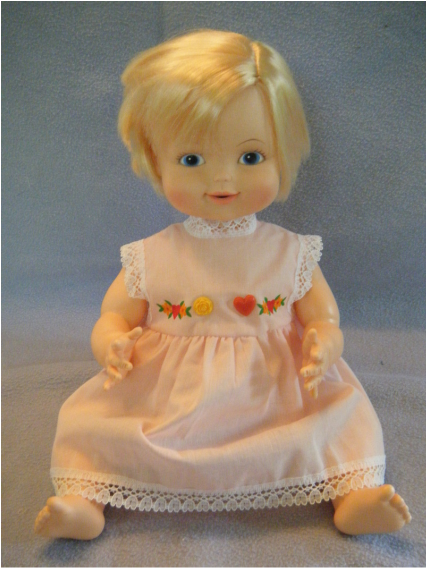 The markings on the voice unit indicate that it is an Ozen product and made in Japan (typical of talking dolls from the 1970s). 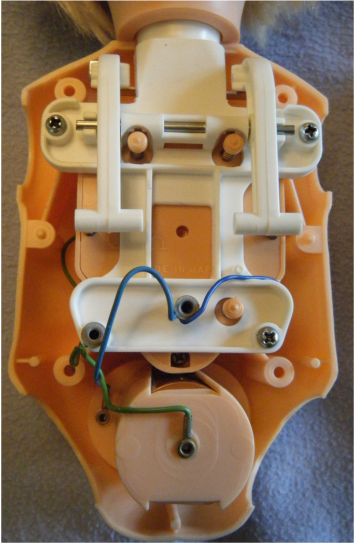 The 3 pinkish islands rising above the white mechanism are the switches corresponding to the 3 pins on the doll's clothing. Pushing any one of the buttons will cause the doll to speak. (Side note: she is one the clearest speaking dolls I have ever heard). The white mechanism is the framework for two rocker arms (right and left) that transmit motion from the spoon and bottle in the doll's mouth, through the neck, to the 2 buttons underneath the "T" tips. One button activates the "Yummy, yummy, yummy" phrase and the other the "I like my bottie" phrase. 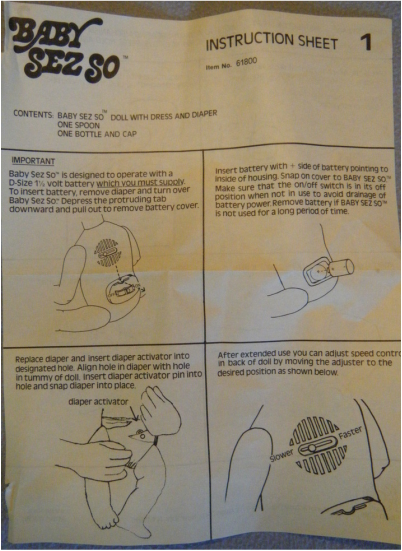 The rockers were "stuck" from lack of use. I moved them up and down a few times and the mouth phrases started working. We reassembled the doll. 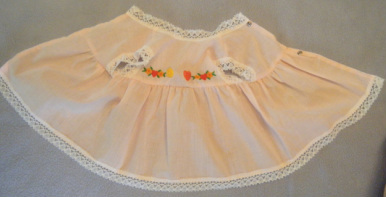 It is essential that this doll have its original dress. 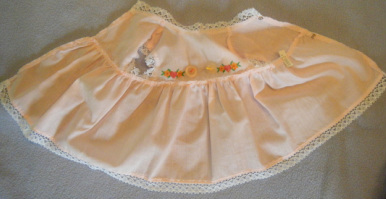 The dress includes two plastic pins that insert into the doll's body. The pins activate the switches that make the doll speak. The print on this dress looks like it just came off the assembly line; very crisp and unfaded. The yellow flower is part of a plastic rivet that activates the phrase "Baby pretty now" (think pretty like a flower). The red heart is a rivet that activates the phrase "I love you, mommy" (think love like a heart). 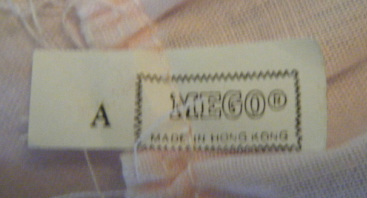 The tag sewn into the dress states that it was made in Hong Kong. 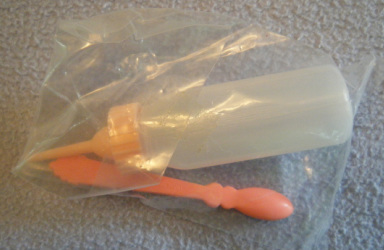 The bottle and spoon accessories were still sealed in the original bag. The bottle states that it was made in Hong Kong. The long tip is critical for activating the lever located in the roof of the doll's mouth. The spoon is much fancier than the bottle. 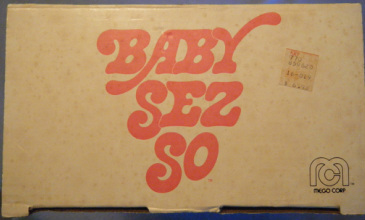 It is monogrammed with BSS for "Baby Sez So". The back of the spoon states that it was made in Hong Kong. The back of the dress shows where the plastic pins protrude. The dress itself fastens with old school metal snaps. This is the reverse side of the plastic rivets in the dress. The red and yellow pins need to insert into corresponding holes in the doll's torso. I imagine that many of these pins got broken due to the dress shifting around when the doll was played with. The diaper is another critical part of the doll. 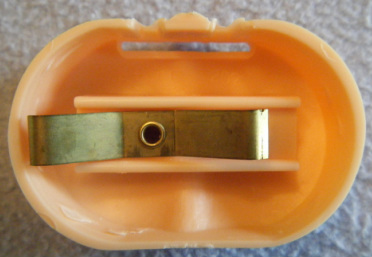 It too has a plastic rivet that needs to insert into a corresponding hole in the doll's body. This pin is responsible for activating the switch that makes the doll say "Mommy change me". This doll was clearly not produced earlier than the 1970's because it makes use of that Apollo space program fastener known as "velcro". 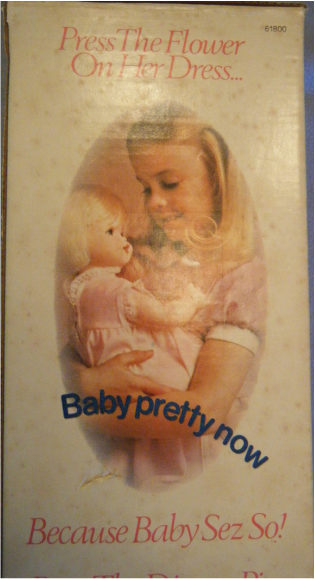 You can tell that this doll is a product of the 1970s and not the 50s or 60s because of the disclaimers that appear on the box. One disclaimer states, "Design and colors may vary from those illustrated". This allowed the manufacturer to have different suppliers. The other disclaimer states that the doll is manufactured from components made in different countries. Recognition of globalization in its infancy. The original price tag is still on the box. This doll sold for $6.98. Getting the instructions with a doll is again proven to be worthwhile. The operation of the clothing pins was pretty obvious but the spoon and bottle were a little hard to figure out when they weren't working. The diagram showing the close-up of the mouth was particularly useful for the bottle. The little cup that the bottle tip was intended to press against had receded into the doll's head and was nearly invisible and unreachable by the bottle. If you study that same instruction panel you can see where the technical writer had originally typed "I like my bottle" and then altered the "l" to make it an "i" to match the doll's silly verbalization "I like my bottie".